When we chose to live in rural France I didn’t imagine it would be easy to adapt, but thought the most difficult thing would be to master the language. In this, I was mistaken. The hardest part was coming to terms with the attitudes, customs and “French common sense”. It felt less like a neighbouring country and more like another planet. During the period of adjustment, to amuse myself and our friends, I started to write short accounts of our experiences and, for the first time in my life, whimsical poems. However, after two years a chain of events started undermining our lives. Short stories became too painful to write and my light poetry alternated with much darker material as I suffered increasingly from stress and insomnia. It took a long time before we could start to rebuild our lives. Finally I was able to re-read my poems, both light and dark and it dawned on me that there was a narrative running through many of them. With huge support and technical aid from my wife Jane, I turned these pieces into an epic poem, published first in the form of an e-book, then as a paperback and finally as an audiobook. 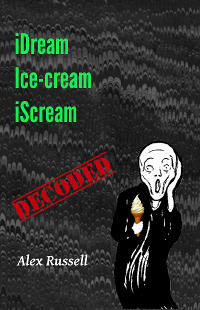 In response to comments from readers belonging to a different generation or a different culture (especially for whom English was not their first language), I produced a new paperback version: ‘IDream Ice-cream iScream - Decoded’ which, at the back of the poem clarifies the intentionally ambiguous use of words and phrases and gives sources for the references used. Subsequently, I published as a paperback the short stories and remaining poems, which centred on our early experiences and encounters in France. Using a play on words for the title: ‘A Russell in the Undergrowth - Decoded’, I gave titles for each chapter starting with the letters U then N, then D,E,R,G,R,O,W,T,H. I have included here the first third of the print and audio versions of ‘iDream Ice-cream iScream - Decoded’ and selected extracts from ‘ A Russell in the Undergrowth - Decoded’. 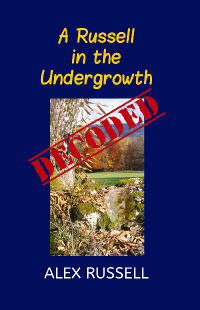 ‘A Russell in the Undergrowth - Decoded’ is available from Amazon as a paperback.